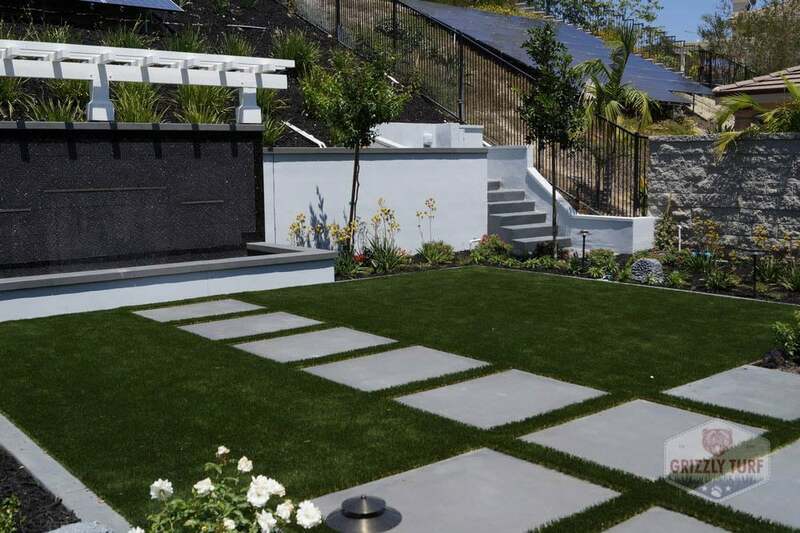 We could go on for days talking about how amazing Grizzly Turf is at offering superior service, lifelike artificial grass products, and unmatched installation craftsmanship. However, it’s safe to say that we may be a bit biased… That’s why we have created this page so that you can see what real customers have to say about Grizzly Turf. You don’t need to take our word for it, see for yourself what all the fuss is about! We recently had Grizzly Turf do an installation in our back yard in the city of Orange. In short, they did a beautiful job. From the estimate to the install to the follow-up, they were prompt, polite and professional. Our yard looks great and we couldn't be more pleased. We recommend them unreservedly! I got 3 companies to give me estimates. Grizzly Turf is the most professional and trustworthy. Kevin is the estimator. I was very impressed with his professionalism, knowledge, and honesty. The other companies tried to make it seem like artificial turf is maintenance free. It is not. Kevin went over the basic maintenance requirements, the pros cons, and the different types of artificial grass. In comparison, another company that I was less impressed with brought a bunch of samples as well. The guy put all the 12+ different types of samples on the ground and told me that they are all the same. I was supposed to pick which one I like. They were all the same price too. That was definitely a red flag. Kevin, however, suggested the type of grass based on my need. Unfortunately, I ended up going with real grass. But if you want artificial lawn, I would go with Grizzly. After multiple consultations, we knew Grizzly Turf was the best choice. From the moment we set up the appointment, there was a strong sense of professionalism. Then, when Matt came to our home for the estimate, he explained everything in detail and took us through their process, step by step. This stood out to us because other companies didn't go into detail nearly as much as Matt did. He answered all of our questions before we could even think to ask. Very impressive. Once we decided to set up installation, we had our grass less than a week later. We also appreciated the confirmation call from Lucas a few days ahead. The day of installation, Ernesto and his crew were great and took pride in their work. We were impressed with how he went over everything before starting, to make sure they got it right. The next day, we received a follow up phone call from Hunter (very kind and professional), asking us about our experience. That was a nice touch. Thank you, Grizzly Turf, for making our yard beautiful once again. We spend so much more time outside now. Our kids love it and we couldn't be happier. Wolfie was very informative and thorough in his sales presentation. He was able to come out within a few hours of us speaking to Victor about setting up an appointment for a free consult. Did not come off as pushy at all and gave us all the information we needed to make an informed decision on what would best fit our needs. Victor made the entire process so easy--we never had to leave the comfort of our home for anything. Well, other than to check out a couple of installs at other homes which we insisted on doing since this would be a huge investment of our money, everything else was done via phone or email. The day of install was quite seamless. The crew of 4 arrived on time at 8:15AM and were done by 4PM. They left my backyard looking more beautiful and cleaner than ever. The turf has made a huge difference in our backyard--makes it look so much larger, more beautiful and is now an enjoyable, safe space for our kids to enjoy for many many years to come. Needless to say we are very satisfied and would highly recommend them. I've attached a few before/after photos for reference. We selected the Diamond Pro Fescue. My family and I moved to California a few months ago and in that time it's been nearly impossible to keep our lawn maintained! Despite all efforts our grass is still... terrible! After speaking with a few neighbors they recommended artificial grass. We received several quotes from other artificial grass companies & Grizzly Turf was by far the most knowledgeable and friendly company. The consultant wasn't pushy, just there to help and give a lot of information. The entire staff made me feel SO comfortable they were so on top of everything and the installation turned out flawless. Im so thrilled with the experience and it was the best decision that my family could've made! No more dead grass and crazy maintenance. I'd recommend to EVERYONE looking for a great company that will go above and beyond to make you happy. Had an appointment today for an estimate for artificial turf around my pool area from Grizzly Turf. After looking at it, he recommended I not put turf I that area because of the many near surface tree roots that he felt would quickly make it uneven. I was very impressed by his honesty as he could have just taken the job and the money. I definitely got the sense that he would be very trustworthy and would have done a great job if my yard was a better candidate. Being in California, my husband and I are always looking for ways to reduce our water consumption. we have already created, an almost water free front yard. Our backyard was looking ugly and dry. So, we reluctantly thought about "fake grass". So, we interviewed three companies to learn more about artificial turf. We were very interested in prices. The range was wide, mostly very high. We also watched a number of videos on U Tube showing the various methods of installation. We were amazed at the skill it takes to do a proper installation. Home Depot account. Lori is very knowledgable, friendly, and, not pushy. We were excited to have this company do the installation. The work was scheduled within the week. What a fantastic crew of workers. They were friendly, reliable, clean, fast workers. The job was completed in half a day. If this had been a negative experience I would be writing about it. However, as you can tell, this is not the case. Do not hesitate to have them do your artificial turf. WE ARE TOTALLY SATISFIED!!!! Grizzly Turf were fantastic I love the product and the service was fabulous. I recommend them to all of looking for turf they do it the right way. Thank you to Victor and his wonderful staff. We chose Grizzly over another company simply because of their outstanding customer service and presentation. Our other bid was slightly less but we felt more confident with their expertise and professionalism. Our front yard was dead as can be. We were worst on the block and after completion we went to first! The crew arrived at about 7:30 (I was told 9:30 but I could have misheard - no biggie, it just means the job will be finished sooner) and they finished around 4:00 the same day. We had about 900 square feet of the grass being installed as well as a tree being removed. The quality of the grass is outstanding! We used the 65 ounce Everglade Fescue and we're already getting many compliments on how real it looks. The crew working in the install was fantastic. Brittani was great about answering and returning calls. Victor is a very passionate and professional owner. My husband's dream is to have a putting green in our backyard and should we be able to afford to in the future, Grizzly Turf will be our only choice for the job. Thanks for the quick and painless installation! Grizzly Turf was our 3rd estimate - we were really impressed by the prompt response from Hunter & our appointment scheduling was quick and easy. David showed up to give us an estimate and he was professional, easy going and we had a great feeling already. But then the quote!! Oh man but I'd have to say the excellent work and communication by the install team impressed us most. These guys work hard!! They showed us on time, were neat - very attentive to our home and super helpful with suggestions about the drains and questions about our dogs, etc. All along we had great communication from Brittani - way to go guys A++ company thank you we LOVE it!!! From the start Grizzly Turf was top notch in customer service. Unfortunately, I did have an issue with turf burn when installed because of the angle the sun hit my window, but whether I was working with Hunter, Brittani, or Lucas ALL of them were so understanding, reassuring, and helpful! They went as far as contacting the window tinting/solar screen company to help me with this. Overall, they went above and beyond to help make this project an eventual success. I would recommend this company to anyone who was looking for quality artificial grass and amazing customer service! From start to finish, this company was amazing to work with. They were quick to provide an estimate and provided tons of samples. I really liked how they explained everything and never pressured me into a certain type or brand of turf. Everyone I dealt with from the phone (Brittani), the estimator (Travis), and the owner (Lucas), they were all great! The workers had everything installed in one day and cleaned up after themselves. I wish I could give this company more than 5 stars because hey deserve it. I would highly recommend this company if you are looking to get artificial turf installed! Grizzly Turf was a wonderful experience. The customer service was wonderful and they were actually able to fit us into the schedule earlier than they thought, which was a great surprise. They have one type of turf that does not get as hot as the others that they recommended we use because we have a dog. It looks great and it doesn't get too hot in the sun for his paw pads. They installed while we were at work one day and we just came home to a beautiful yard. It was no hassle to us at all. The final product looks great and we couldn't be happier. This review for the Introduction/Bidding process only. We have a super small backyard and with El Nino coming (well that might be debatable since it was 84 today and it's almost Nov), we were worried about just having an all dirt backyard. So we started getting bids from all the reputable artifical turf companies we could find on Yelp! Grizzly Turf answered our call immediately and very professionally. They sent someone out to give us a bid right away and the process of getting that bid was informative and efficient. They measured twice to ensure that the square footage would be right, went over all the details with us and the owner of the company even called a couple days later to ensure that we had all the information we needed. We could not be happier with our turf replacement project. The process was seamless and the final product is exactly what we wanted. We added some drought tolerant plants and are extremely pleased with the final look. All of the staff we worked with were helpful, knowledgeable, and professional. I highly endorse and recommend Grizzly Turf. Extremely professional in all respects, from the office manager Brittani, to Wolfie the salesperson and to the crew that installed the turf. The lawn looks great and we're very happy. Highly recommend. I don't have a single negative word to say about GT. They were an absolute delight to work with. From the initial phone call to the very last follow up call. I would highly recommend them to anyone looking for pressure free information on synthetic grass. I requested information for a quote online and I received a call from Brittany within minutes of pushing send. She scheduled my wife and I an appointment at our convenience and Wolfie showed up on the dot. My wife and I are new homeowners and we are both flabbergasted by the lack of customer service with plumbers, electricians, landscapers, millworkers you name it. So many of them show up late or not even at all never to be heard from again! So my wife and I could immediately tell they pride themselves on timeliness and customer support. Anyways, Wolfie did his measuring and gave us the low down on all types of grass they have to offer. He pointed us in the right direction taking into consideration the foot traffic it gets now and will get in the future and our little pug Koufax. We never felt pressured to make a decision, when he left he said have a great day and we hope to hear from you. I cant tell you how many times I have received quotes on various projects and felt as if they wanted an answer then and their! Once we agreed on the contract, all the paperwork was done online. I was at a charity event that evening so my wife stayed home and was never bothered as a small army tackled the yard in a day and a half. Once they were done all that was left was a beautiful backyard, no signs of 20+ men being there for two days. Everything was clean! In the end we couldn't be happier with our new grass. Koufax loves it, we love it, our friends love it and even our neighbors love it. If we ever decide to do the front yard we know who we're calling. Grizzly turf is top notch. Brittani and Travis were very helpful and extremely knowledgeable. Consistent follow up and got us scheduled very quickly. Install was perfect and they sloped the turf to work with our backyard and it looks completely natural. I would definitely suggest them to anyone looking for artificial turf. With these crazy California droughts, I needed to change my lawn landscaping to be more eco-friendly and sustainable. I was super interested in getting fake grass to reduce my water costs and ensure a beautiful garden look for the long-term. I do not have a green thumb so it was really hard for me to keep my garden looking fresh and green. Grizzly Turf (GT) has a great reputation in Orange County and LA and my neighbors had a great experience using GT. They also have very reasonable pricing. I decided to give them a whirl. GT kept delivering from our first call to consultation to installation. I wanted an estimate for our front and back yard because our grass was dying. GT had the most realistic turf products compared to competitors and they also had very reasonable prices. Wolfie was beyond knowledgable and spent extra time explaining the ins-and-outs of products and installations. The installers showed up and took care of the installation in one day and took away all the dead grass. I didn't have to clean up a thing! It was amazing to come home to a nearly perfect landscape! Jason & Adrian were really great and answered all of my questions during the day of the installation. A gentleman named Hunter was in contact with me throughout the whole process and even followed up after the installation to ensure I was 100% satisfied with the end result. Of course I was! Overall, I felt extremely comfortable throughout the whole process. None of the other companies took the time to really understand my needs or answer my questions in a timely fashion. If I had to do it all over again I would buy a second house just to work with Grizzly Turf again! I could not possibly recommend them more. Take a peek at my pictures so you can see just how awesome my lawn looks! Grizzly Turf is AMAZING! I found Grizzly Turf through Yelp due to great reviews. The team impress me from the beginning: Britney/ Hunter's prompt customer support as well as David's detailed explanation helping us to find the synthetic grass that suitable for our life style. I didn't look for another company for price comparison as I think the Yelp reviews already did the job for me. The workers were diligent and professional; on top of the actual installation, they put in lots of time to prep and clean up. We met the owner Lukas after the completion; he had a walk-through with us, making sure we are satisfied. They have 15-year warranty on the material and 2-year warranty on the labor. Overall, they are exactly what the Yelp reviewers describe (THANK YOU!) I look forward to enjoying the new area with my family and are very happy to add another 5-star review to this great company! Wow! Top notch customer service! Unfortunately they were unable to help me with my current project as it didn't meet their minimum(which btw is still much less than the other companies I checked into). Brittani was amazing! Most companies would just say thank you but we are sorry, can't help you. But not Grizzly. I definitely plan to use them in the future when I do my whole yard which is a much larger project. I highly recommend Grizzly Turf! Their customer service is outstanding! Brittani Miller went out of her way to help me with a patch of grass that I needed. Call them you won't be disappointed. Thanks to the YELP comments regarding Grizzly. Because of the reviews, I chose Grizzly. They did my house Monday and Tuesday in this terrible heat wave (105/96) without complaint. The work crew was polite and knowledgable. When I asked questions, they were very helpful. I would not hesitate to recommend Grizzly and there fine crew. 3 playful dogs and live grass don't mix! We obtained several bids for artificial grass due to the cost of the project. All of the companies were highly rated on Yelp. We initially liked all of them, but when we started asking additional questions and for more referrals they did not respond. Grizzly was professional and attentive from our initial contact. The Grizzly Estimator was one of the only ones that expressed concern with possible turf burn from our windows and suggested we contact a window/tint company. Brittani followed up periodically to see if we had any questions and where we were at with our decision, but was not overbearing. Once we made the decision to have Grizzly do the work, everything went very smooth. The crew was efficient, polite and seemed to enjoy working together. They did a great job on the installation and you can't even tell where the seams are. Couldn't be happier with the job these guys did on my backyard. David came out for the estimate and didn't BS me like three other companies had. Another popular turf company tried to charge me almost twice as much and their products were no more impressive than what Grizzly Turf had to offer. I called the next day to schedule the installation. Less than two weeks later my project is finished. The guys showed up earlier than expected which was nice. They worked their asses off for 12 hours in the 110 degree inland empire heat and got it done in one day. I'd check in every once in a while, only to see how thorough these guys were being with their work. Then they cleaned everything up and were on their way! I used the HERO program to finance the project and the process was seamless thanks to Hunter. And also thank you to Hunter for checking in on the dogs and I after the completion of the project. My dogs have been running/rolling around on dirt for the last year so they are pretty stoked on the change! We're even more stoked because in the two days we've had the turf, our house has remained clean and (mostly) dust free! Ultimately I chose this company because they are Veteran owned and operated, and as a Navy veteran that's important to me. The great Yelp reviews didn't hurt, so I hope this as helpful to others as the other reviews were to me! If the first impression is an indication of how your future interaction with a company will be, Grizzly Turf did not disappoint me at any level, from my first conversation with Brittani (office coordinator), to Wolfie's visit for the estimate, the hard working crew on installation day, the follow-up with Brittani, and everything in between. The courtesy, knowledge, professionalism, and efficiency of the people is equal to the great quality of the product. I must also add that at no point during the process did I feel pressured to act swiftly. My first contact with Grizzly Turf goes back to early February, when I talked to Britanni, asked a lot of questions, and scheduled an appointment for an estimate for my sloppy front yard. Wolfie showed up on time, is very knowledgeable and detailed in his presentation. He considered my needs and proposed a product accordingly, which did NOT happen to be the most expensive one. As a lay person, I wanted to see what else is available on the artificial grass market and contacted another company. They were also nice, but I did not have that same first impression feel I had with Grizzly Turf people. For unforeseen reasons, I had to postpone my project. We were back in business. Now, I open my curtains in the morning and see that beautiful, lush, and green front yard. We just had our new turf (750 square feet of 65 weight Fescue) installed 2 days ago. The process from free quote to purchase to installation was painless. We obtained quotes from three companies; and though Grizzly Turf wasn't the cheapest, we went with them based on these Yelp reviews as well as their outstanding level of customer service. They really do embody the Nordstrom/Zappos approach to customer care. Hunter was our primary contact through the whole process. He was outstanding and never dropped the ball. He returned my calls in a timely manner, and always asked if I needed clarification on anything. Matt was the sales person who performed our initial assessment. Unlike the other vendors, Matt went above and beyond sharing his expertise on how the turf should be configured, why they add a little slope during the process, what all the components are, etc. Based on our specific needs he shared his thoughts on which product we should purchase (which turned out to be less expensive) rather than trying to upsell us. The multi-person installation crew was also amazing. They arrived on time, worked diligently throughout the day (there was a lot of material they had to truck back and forth), completed the job when expected, and most importantly left both the front and back yards in better shape then when they arrived. They swept the dirt from our back yard patios, moved the rocks and smaller pebbles they had to move out of the way back into their original places, and also cleaned our front driveway. Sure it had some dirt and debris from the whole process on it; but our jacaranda's leaves were also taken care of! The best example of their attention to detail however was how they wove the turf into the existing cinder blocks that outlined the patios and back planter. It looks like the grass naturally grew in those spaces. If you can't tell already by this novel I've written, we are very pleased with the experience. In fact we learned on installation day that we can use Grizzly Turf for a project we have in mind for the front yard (even though it will most likely not include turf). We would absolutely trust them to handle that bigger job. Hats off to them (and to Home Depot for the referral)! I went with grizzly turf due to all their great reviews and I'm glad I did. Their customer service crew and installers are courteous, knowledgeable and professional. The products they carry are high quality made not like some other companies. We love our new turf and most importantly our dog does too! Thanks again grizzly turf!! Grizzly Turf is the only way to go! They're the most knowledgeable company hands down and they're the only one around that takes time to inform customers about the differences between different products. Brittani was an absolute rockstar in coordinating our consultation and install, and the installers were very fast and professional. I would recommend them to ANYBODY in SoCal looking for a quality yard. Extremely satisfied! Grizzly Turf just completed installation of our lawn, which is beautiful. This company is very professional and caring about their customers throughout the installation and beyond. Brittany, from Grizzly Turf, made sure after the install that we were happy and that we had no questions. She is a joy to work with. The actual installation took 3 days, including all of the prep work. The installers were real craftsmen, with perfect cuts around flower beds, planters, etc. i would heartily recommend Grizzly Turf to anyone thinking of having artificial turf installed. Hiring Grizzly Turf to install the artificial turf in my yard was one of the best landscaping decisions my husband and I made. We had the turf installed a few months ago. Everything from the initial consultation to the actual installation went very well. However, a few months after the installation I noticed significant lines running across our turf, which made it obvious that it was indeed artificial turf. Actually, I noticed some faint lines the day of the installation but wanted to wait a few months to see if they would go away on their own but it only got worse. So I reached out to Brittani by phone and emailed her a photo and asked her if there was anything they could do to fix the issue. A few days later, she told me that they reached out to the manufacturer and ultimately decided to replace my turf under warranty. Turns out the turf they installed may have been defective. Halfway through the second installation, I noticed that as they were laying the replacement turf down that there were the exact same lines running across the turf as my original turf. One of the installers (Ernesto) called his manager to let him know and they agreed to replace the turf a third time but to make sure the roll was from a completely different batch. A few days later, Ernesto and his assistant came back again with the third roll of turf. The third time was a charm and now my turf is beautiful. I didn't realize how bad the lines really looked until they were no longer there. The following day, Brittani called me to find out how the installation went and if I needed anything else. They really go above and beyond. Although the first installation wasn't perfect, I was very impressed with how this company handled my situation. They provide excellent customer service and were always open to answer any questions. It was the most hassle free experience and their company is a testament to how all customers should be treated. Highly, highly recommend Grizzly Turf! Let me start by saying I was a bit tentative when it came to turfing the backyard of my new home. I didn't know anything about the process/, it seemed very expensive, and i had seen both ends of the spectrum in terms of finished product (hyper-realistic vs. creepy green fuzz). Wolfie immediately cleared up any concerns i had during my consultation. They came in and did the installation only a week later, while i was out of town. I came home to a perfectly manicured yard, you would have never known a team of guys had been tearing up the place 48 hours ago. Cannot thank them enough. Worth the price! I've already reached back out to schedule a consultation to turf my front yard, and look forward to seeing Wolfie again! We had a great experience with Grizzly Turf. They were the last of 3 estimates I had gotten to redo our front lawn. Wolfie (salesman) was very friendly and knowledgeable and answered any question I had, with an honest answer. After a week or so, we decided to move forward with the job. At that time we started to work with Brittani (office manager). She is very friendly, understanding and knowledgeable. They came in and did the installation about 2 weeks later, while we were out of town. We came home to beautiful yard!!! I can't say enough on how good the lawn looks and there is no way to tell where the seam is. I would highly recommend Grizzly Turf and will be calling them when it is time to do the backyard. We replaced our backyard grass with artificial turf and we are absolutely thrilled. Lucas and his staff are very friendly, professional, and provide incredible service. Our yard was completed in one day and their operation is seamless. In addition, they stand by their work and do whatever it takes to make sure you are satisfied. I was so impressed by all the reviews that this company received that I decided to take a chance on them. My grass in the front yard was almost totally dead and looked like an abandoned lot.Travis came over and carefully measured our yard and spent over an hour explaining the process. He left us with samples to make sure of our choice. Eleven workers showed up on time and spent the entire day putting in the turf. We now have a show place front yard. People in the neighborhood have stopped us to ask about our beautiful "grass". Instead of giving so much money to the greedy city, we chose to spend it on a beautiful lawn. Thanks Grizzly! From the call, to the estimate, to the install...these guys deserve 10 stars. Great experience all around with this company and the "extra" attention the sales guy (Tyler) did for us. I LOVE OUR BACKYARD! Having 2 dogs, it was a disaster in our yard for some time. I forgot how nice it can look...it actually took some time to get used to it. Wolfie was great and answered all my questions, and Hunter was so thorough in his follow-up, even during installation. Great team, great process, great product!